managed to promote the health of its foothills rough fescue grass. western wheat, green needle, June, spear grass, two species of fescue and others this writer can’t remember. 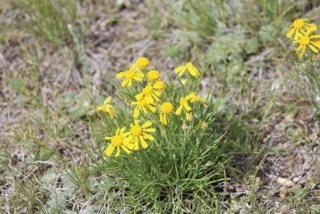 The plant lovers in our group were rewarded with a wealth of prairie flowers. Despite the dry winter and spring there were many lupine (both of the two most common perennial species), sticky purple geranium, gaillardia, yellow umbrella plant, yarrow, showy stickseed, blue-eyed grass, death camas, pale comandra, puccoon, at least two species of groundsel, blue phlox, a number of species of vetch and many others too numerous to name. One flowering plant is worth a special mention: tufted hymenopappus, listed as one of Alberta’s rare plants. This plant, with leaves that look like California poppy, is found in Alberta only on dry sandy hillsides in the far south of the province. In contrast to the plants that thrive on the dry hillsides were the shrubs—saskatoons, chokecherry, gooseberry, buckbrush and even willow—in the moist draws. Many of the people on this walk were members of the Lethbridge Nature Society. 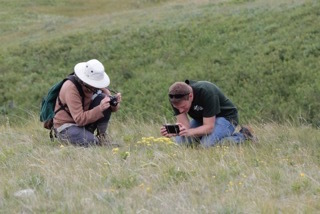 In addition to their interests in the plant community, their enthusiasm for birds and other animals was rewarded with sightings of Ferruginous hawk, Swainson’s hawks, song sparrow, and unusual for a dry location, common yellowthroat. The weather was beautiful for our walk—not too warm with only the slightest breeze to keep away the mosquitoes. To make the day complete, on the brow of a hill we came across what appeared to be a tepee ring. Sounds like a terrific day. I’m going to see if gardeners in my area might do something similar.